MALCOLM SAVILLE was one of my favourite authors when I was growing up, though his books are no longer as popular as they were. He described the Shropshire countryside so well that I felt a strong pull towards the place, and even the names of the Long Mynd, the Stiperstones and Church Stretton still give me a shiver of excitement all these years later. First introduced to me at the age of 11 by my form teacher, the books about the four, six or sometimes eight children who made up the Lone Pine Club inspired me to form an offshoot Lone Pine Club with my friend, though unsurprisingly we never had the sort of adventures Saville’s characters did. He wrote his first book, Mystery at Witchend, in 1943 when his children had been evacuated to Shropshire from their home in Hertfordshire. It was followed by a further 19 books in the Lone Pine series, as well as several other series of books for children, and many of his 90 books were broadcast by the BBC. He died in 1982. 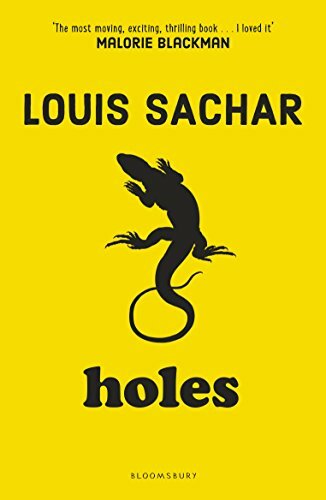 LOUIS SACHAR is an American young-adult mystery-comedy author, best known for the award-winning Holes, which won the 1998 US National Book Award for Young People’s Literature and the 1999 Newbery Medal for the year’s “most distinguished contribution to American literature for children. In 2003 Disney turned the book into a film, with Sachar himself writing the screenplay. He lives in Texas. CATHERINE STORR was an English children's writer born in 1913, best known for a series of books about a wolf ineffectually pursuing a young girl who outwits him every time, beginning with Clever Polly and the Stupid Wolf (1955), which she wrote for her daughter Polly. In 1958 she wrote a novel for slightly older children called Marianne Dreams. 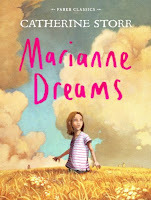 This book was made into the TV series Escape Into Night and the film Paperhouse, though she was not fond of the latter, especially the ending. Her books often involve confronting fears, even in the lighthearted Polly stories, and she was aware that she wrote frightening stories, but felt that reading about evil gave children some power over it. She worked as a doctor for some years while regularly producing new children’s books, and she continued writing until she died in London in 2001, aged 89. ROBERT LOUIS STEVENSON, born in Edinburgh in 1850, was a Scottish writer, poet and musician, whose most famous works are Treasure Island, Kidnapped, The Strange Case of Dr. Jekyll and Mr Hyde and A Child’s Garden of Verses. He grew up in Scotland but he suffered from poor health all his life, exacerbated by cold and damp, so after frequent trips to Europe and America, on his doctor’s advice he spent most of his adult life living in warmer climes. He died in Samoa in 1894 at the age of 44. 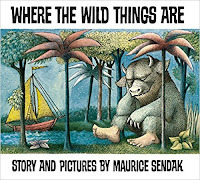 MAURICE SENDAK was an American illustrator and writer of children’s books. Born in Brooklyn, New York, in 1928, to Jewish-Polish parents, his childhood was affected by the death of many of his family members during the Holocaust. 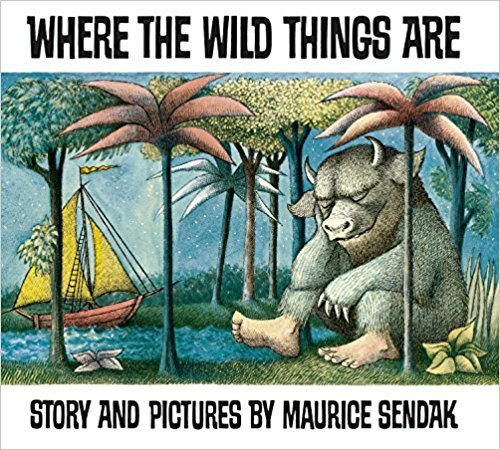 He became widely known for his book Where the Wild Things Are, first published in 1963. He also wrote works such as In the Night Kitchen, Outside Over There, and illustrated many works by other authors including the Little Bear books by Else Holmelund Minarik. In 1970 he received the third biennial Hans Christian Andersen Award for Illustration, recognizing his "lasting contribution to children's literature". He died in 2012. ROSEMARY SUTCLIFF was an English novelist best known for her children’s books, especially historical fiction and retellings of myths and legends. When very young she was stricken with Still’s Disease, and spent most of her life in a wheelchair, but wrote incessantly throughout her life. Inspired by the children’s historical novels of Geoffrey Trease, her first published book was The Chronicles of Robin Hood in 1950. 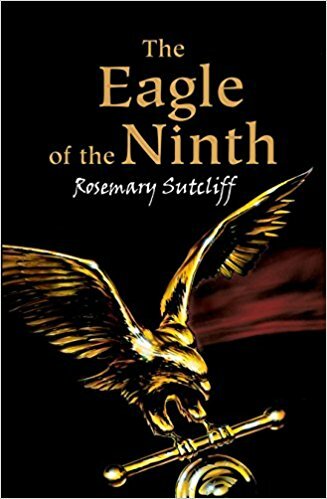 In 1954, she published what remains her best-known work The Eagle of the Ninth, part of a series of 8 books on Roman Britain and its aftermath, and this was followed by many other novels for children and adults. For her contribution as a children's writer Sutcliff was a runner-up for the Hans Christian Andersen Medal in 1974, and the third book in her Eagle series, The Lantern Bearers, won the Carnegie medal in 1959. She was also awarded the OBE in 1975 and the CBE in 1992, shortly before her death in Sussex. JEREMY STRONG was born in London in 1949 and following a spell as a teacher and head teacher, now writes humorous books for children, mainly of junior school age. 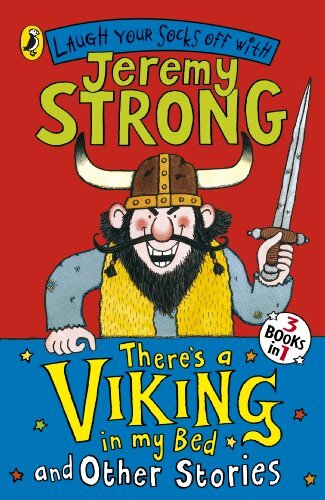 These include My Mum's Going to Explode (2001) and There's a Viking in my Bed (1991), which was dramatised for Children's BBC Television. In 2001 the Federation of Children’s Book Groups named his I’m Telling you, They’re Aliens one of the 50 best children’s books of the year, and in 2003 Krazy Kow Saves the World - Well, Almost (2002) won the same honour. Several of his stories have been adapted for BBC Radio. He now lives in Somerset and is currently leading a 'Campaign for Fun', to encourage reading for pleasure. JOHANNA SPYRI was born in Switzerland in 1857. She wrote many novels, especially for children, but is best-known for her book Heidi. Heidi is the story of an orphan girl who lives with her grandfather in the Swiss Alps, and is famous for its vivid portrayal of the landscape. She died in 1901. NOEL STREATFEILD was another of my favourite authors when I was growing up. I listened avidly to her books broadcast on Children’s Hour on the BBC, and borrowed those and others from the library. She was born in 1895, the second of five surviving children of a vicarage family (hence her close experience of and sympathy for children born into large impoverished families) and worked for ten years as an actress. She later used her familiarity with the stage as the basis for many of her popular books for children, which were often about children struggling with careers in the arts. She is best known for her children’s books including the “Shoes” books, such as Ballet Shoes, (1936) her first book, which was commended for the Carnegie medal and launched a successful career in writing. This was swiftly followed by Tennis Shoes and Circus Shoes, which won the Carnegie medal in 1938, and others including Party Shoes and my own favourite White Boots (originally entitled Skating Shoes.) Several of her books have been adapted for television, and in 2007 Granada television adapted Ballet Shoes as a full-length feature film starring Victoria Wood and Emma Watson. She won the OBE in 1983 and died in 1986. ANNA SEWELL, born in Great Yarmouth in 1820, is also famous for one particular book. 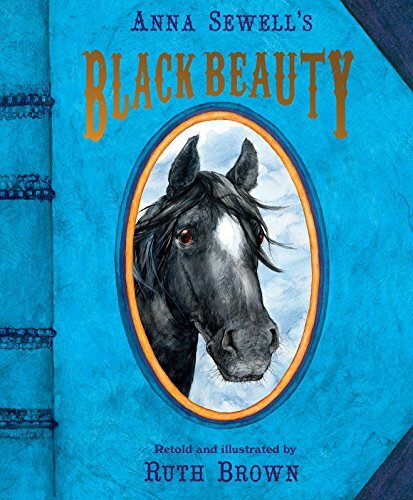 In 1877, when she was 57, her only novel Black Beauty was published, and is now recognised as one of the top ten best selling novels for children ever created. At the age of 14 she injured both her ankles, and from then on used horse-drawn carriages to get about. This contributed to her love of horses and concern for the humane treatment of animals. Although the book is now considered a children's classic, Sewell originally wrote it for those who worked with horses, hoping to induce an understanding treatment of them and reduce cruelty to them, and the book, written from the point of view of the horse himself, could be said to have achieved this aim. She became very ill shortly after the book’s publication, and died soon afterwards in 1878. DR. SEUSS is the pen-name of Theodor Seuss "Ted" Geisel, and American children’s author, political cartoonist, poet, animator, screenwriter, filmmaker and artist. Born in 1904, he is best known for his work writing and illustrating more than 60 books under the pen name Dr Seuss, and his work includes many of the most popular children's books of all time, selling over 600 million copies and being translated into more than 20 languages by the time of his death. He published his first book, And to Think that I saw it on Mulberry Street, in 1937. During WWII he took a brief break from writing to draw political cartoons, but after the war he returned to children’s books. In May 1954, Life magazine published a report on illiteracy among school children which concluded that children were not learning to read because their books were boring. William Ellsworth Spaulding, the director of the education division at Houghton Mifflin, compiled a list of 348 words that he felt were important for first-graders to recognize. He asked Geisel to cut the list to 250 words and to write a book using only those words. Spaulding challenged Geisel to "bring back a book children can't put down". Nine months later, Geisel completed The Cat in the Hat, using 236 of the words given to him. It retained the drawing style, verse rhythms, and all the imaginative power of his earlier works but, because of its simplified vocabulary, it could be read by beginning readers. The Cat in the Hat and subsequent books written for young children achieved significant international success and they remain very popular today. 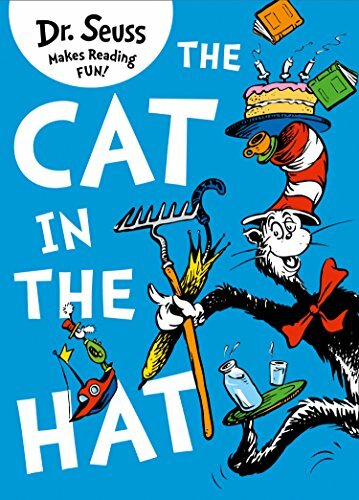 In 2009, Green Eggs and Ham sold 540,366 copies, The Cat in the Hat sold 452,258 copies, and One Fish, Two Fish, Red Fish, Blue Fish (1960) sold 409,068 copies—outselling the majority of newly published children's books. In 1984 he won a special Pulitzer Prize for his "contribution over nearly half a century to the education and enjoyment of America's children and their parents". He died in 1991. The post was an education in itself. Thank you. S is obviously a much loved letter within children's books. So many favourites here! It's interesting - I recently did a retelling of Black Beauty. I'd read it and loved it as a child, but it was only when I reread it for the purposes of retelling that I realised it's a kind of manual for how to treat horses properly - that's its underlying structure, rather than simply the tale of Black Beauty and Ginger, which is what gives the story its emotional heft. I remember getting Malcolm Saville books from the library - they were in the boys' section, where all the good stuff was! - and enjoying them, but I don't remember anything about them. I still re-read Heidi now. 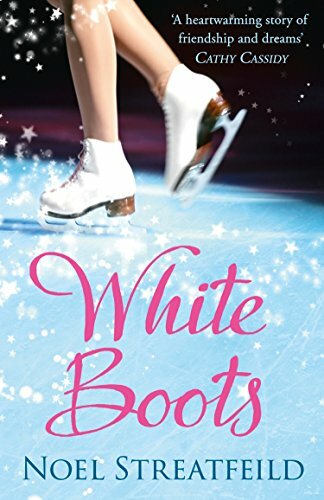 I think you'll find that 'White Boots' was Streatfeild's original title, and the insistence on putting 'Shoes' on the end of a number of her titles was from the publishers of the US reprints. 'Theatre Shoes', for instance was originally 'Curtain Up'. This is a great reminder of so many favourite books, both from my own childhood and from my children's childhood. 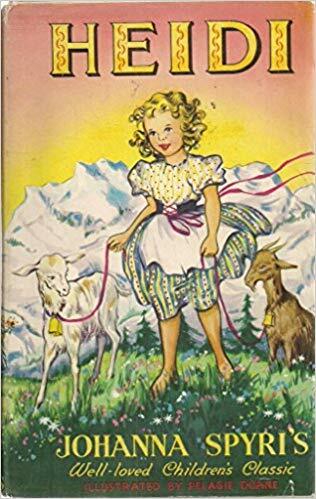 I had exactly that edition of Heidi! And I recently re-read Kidnapped, which was my favourite of R L Stevenson's books, and still love it. I too remember the Streatfeild titles such as 'Curtain Up'. How boring and annoying to have 'Shoes' on all of them! Far less memorable.